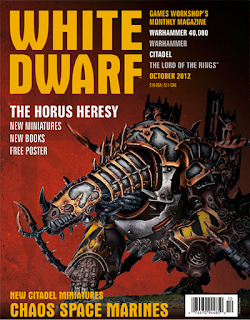 The newly redesigned White Dwarf is out and I just finished reading it. I tweeted about it while I was going through, but it quickly became apparent that what I want to say about it greatly exceeds 140 characters. My instant reactions were "Awesome, it comes with another poster for us to hang in the War Room" and "Sheesh, we paid $10 for a 150 page advertisement?" I'd seen the leaked photos of the Chaos models earlier in the week, but it wasn't until I had the magazine in my hand that I realized they red lit the models. What the bloody hell were they thinking? First of all, they look flat out terrible in that red light and they're too dark. Second, why did you bother to paint them if you were just going to ruin any chance for us to admire the paint job? Please don't ever do this again. Pages 6-47 were straight ads for the new Chaos models, but also included Forgeworld stuff which I heartily appreciate. I like the little blurbs about each model, but they really told us nothing about the kit itself, other than mentioning over and over again the models are in Finecast. Some more details about what you'll actually get would be apprecaited. The price list page also bothered me. It's as though they can't decide if they're making a magazine or a catalog. Either list the prices next to the model, or don't waste my time. Speaking of prices, $50 for the codex? Yikes! We're prone to complaining about prices but come on, GW. It's a book. I haven't paid that much for a some dead trees glued together since my college days. At some point, the prices for the very basic game necessities (like, you know, the rules) are going to start discouraging people from entering the hobby. Hell, ten years ago I was discouraged from starting by the ten years ago prices. And I honestly have zero plans to buy this new book because of it, even though I very much like CSMs. On a more positive note, I like the cleaner format. The old style was incredibly cluttered and a little too chaotic for my taste. I also enjoyed the Army of the Month, because the painter actually got to talk a bit about it. That's the kind of thing that I am interested in seeing in a publication like this. Then they devoted 16 pages to a battle report. I'm going to be a little snobby here and say I couldn't possibly care less about it. It was incredibly lengthy but honestly didn't have a whole lot of substance. I can't decide if it's better or worse than the previous format, although it does have some nice close up images. 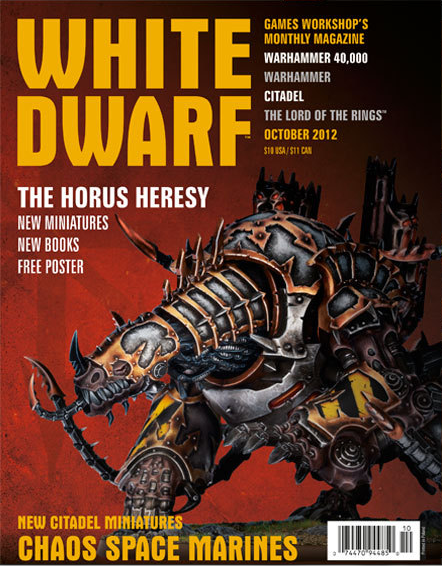 Nearly halfway into the magazine, they deliver the Horus Heresy tidbits. A tantalizing image, some talk about the evolution of the story, and a bunch of plugs for the related Black Library novels and Forgeworld's upcoming Betrayal. Then they drop Primarch Angron on us. Wow. Just wow. I loved reading about the process going into it from the sculptor and I tried not to drool too much on the magazine. The Hall of Fame section made me laugh, because a few months back, I did a top 10 of my favorite 40k models, and Nightbringer was on that list. The Parade Ground section didn't wow me and neither did the Kit Bash. But as concepts, I love the possibilities behind both sections and I'd like to see where they go in the future. The Paint Splatter section left the most to be desired. The section says it "contains a wealth of handy painting tips" but it follows the same step-by-step format in the last few issues, but without much as far as techniques. The paint jobs don't seem up to their usual standard here either, which is odd. What really left a bad taste for me was on that page there is a sales pitch for their How to Paint Citadel Miniatures book. I love the Design Studio. A lot. Looking at the concept art and getting to read what Phil Kelly and Jes Goodwin had to say about working to update the Chaos codex and models was a real treat. For us, these models essentially spring to life fully formed, so it's nice to peek behind the curtain of how they come to life. Why this section wasn't the very first thing in the magazine baffles me. It would have made for an excellent precursor to the new models section. Phew. This review got lengthy. Now time for the important questions. Is it better than before? Certainly. Is there still room for improvement? Yup. Will I spend $10 on it regularly? No. Since a full third of the magazine is the same images, advertisements, and pricing I can get from the website for free, I see no reason to subscribe or even buy it at my local store unless there's something really special about a particular issue. Sadly, there's just too much flash and not enough substance. They're definitely doing some good things, but it's just not quite there yet. However, a lot of the magazine team is new, so hopefully as they grow into their new roles, the magazine will keep improving, too. I'm optimistic about the future direction of the magazine. Seems like a pretty honest review. To much of the stuff I see about GW comes from apologists or haters. It is just hard for monthly print magazine to keep up with the internet where one set of pictures get reposted 100 times before the magazine appears. You mentioned it in your review. Eriochrome reiterated the fact, and I agree. The internet is killing print like White Dwarf. Everything that is in there is available in greater depth and greater quantity on the web for free.. If they gave us a little more substance along with the photos of new stuff, such as talking about what's in the kit, then it can surpass the internet leaks and rumors. But when they're asking me to pay for the exact same thing they put on their own website and nothing more, I just can't go for it. Over all, I agree that it's an improvement. I just also think there are some things they could do to improve it further. It's hard for people outside of the hobby to know what hobby related thing to get you, I went through that with my hubby before I got sucked into the game, too, but the subscription idea is a good one. Which is exactly why they need to keep working at it. There are things they can put in their magazine that aren't going to show up anywhere else- like the concept art for new models. That is a great addition, and it's something only GW can provide. If they keep including segments like that, the magazine becomes vastly more valuable. I haven't seen a list of the CSM codex rules that were included. They look to be photographs of CSM codex pages. Are they legible? Thanks. None of the rules from the new codex are included. They have a few very small, but also very unreadable images of the rules. There's a bit of fluff you can read in the tiny print, but that's it. I think I got a lot more value out of the bat. rep. than you did. The same with some of the articles later in the magazine (Battle Ground, Blanchitsu, Parade Ground). I felt the balance of write ups about each model and then a summary page with costs etc. was a decent balance. Taking it out completely wouldn't work as people want to know the cost. I do see what you mean about how they could have given some more details about the actual models and sprues, in particular the for the Raptors/Talons as they are a multi-part plastic set. 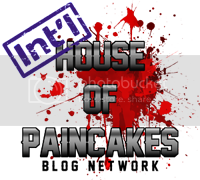 I agree Paint Splatter wasn't much, but I'll need to see over time if will offer more and hence become a well rounded selection of mini guides and tutorials. All in al I was much more positive in my review, although I focused more on the new format rather than the CSM release. I found a lot to be excited about in this magazine and can't wait to see if over the rest of the year it keeps to this standard or higher or drops back to last years deitrus. I completely forgot to touch on Battle Ground or Blanchitsu. That's what I get for writing this at midnight. I like the concept of taking a look at making the terrain pieces. The water spilling out of the pipes is a spectacular effect. I don't want to seem completely down on the new format, because there's a lot of good things in there. I have the same hope as you- that it keeps to this standard or higher. But for now, my $10 is best saved for all the ridiculously amazing Heresy things FW is putting out. If only $10 would get you anything! Can't wait to see more Primarchs. I feel most ready for Ferrus and his Terminator retinue. Been looking over your blog now, very nice. Thanks. Thanks! I'm going to lose my mind over the Lemus Russ one, I just know it. I'm also holding out hope that they'll do one of the Emperor, too. I havn't finished reading it yet myself, but thought I'd add a couple of points. I had the exact same thought as you when it came to putting all the prices on one or two pages. It was a bit anoying when I'm looking at some of the new models and then have to flick through to the right page to find the price. I'd rather they had the prices with the model but my guess is they've done this to make it easier to change the prices in different countries. When they do the Aus or US verision they now only have to change 2 pages as opposed to 50. My favorite bit so far is definately the designers commentary on the new codex. It reminds me more of how they use to do it. I remember they use to be brutally honest about why they made changes, one of the Skaven army books springs to mind when they took out the Doomwheel basically because it was a bit silly (although I'm glad they brought it back). For years now the designers notes have been more of a propaganda exercise like something from 1984, emphasise the good points and pretend that any negative changes just simply havn't happened. This new format hasn't gone completely back to the old ways but it feels a bit more honest to me. I did find the opening statement in the editorial amusing 'We live in a golden age'. In some ways thats right but its clearly not true. I don't like to grumble about pricing too much but have to say that's the biggest reason why its not true. He made some good points in that statement and if the prices were more reasonable then I might have actually agreed with him. Ok so I just realised that all the prices in different currencies are on there anyway so forget that. They fear people copying and releasing stuff before they do, hence little on the future, concept art etc.